MVD Visual, 86 minutes, Not rated. in 1976. 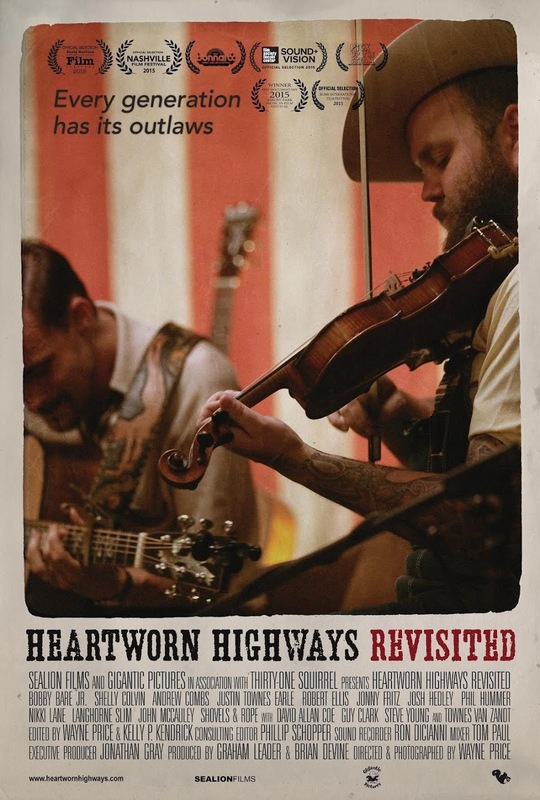 It gathered rave reviews for its fly-on-the-wall look at "outlaw" country musicians, those who wanted nothing to do with industry formula and sought to recover the unpretentious simplicity of earlier generations. His cast of characters included Guy Clark, David Allan Coe, Steve Young, Steve Earle, and Townes Van Zandt. 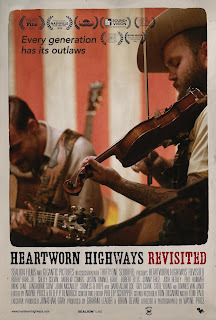 Heartworn Highways Revisited isn't a shot-for-shot remake, but it's 100% faithful to Szalapski's approach and structure. That is, it doesn't advocate, preach, or judge; in fact, there is no external commentary at all. Price simply points the camera, rolls the film, follows the musicians, and allows viewers to draw their own conclusions. Of those he films—including John McCauley III, Jonny Fritz, Shelly Colvin, Langhorne Slim, Nikki Lane, Phil Hummer, Andrew Combs, and Bobby Bare Jr.—most are not household names. Probably the only ones you might know are Shovels and Rope, Justin Townes Earle, and McCauley's band Deer Tick. But if you follow the musical links at the end of the article, you'll probably wonder why these folks aren't headliners. One of the conclusions you are likely to draw is that there are two Nashvilles: the one that's a monument to the industry, and the scrape-by city of those who make music because they must, not because they think they can make a lot of money. Many of today's outlaws have contempt for folks like Kenny Chesney and Toby Keith. Fritz jokes, "What's the difference between a country music concert and an Americana music concert" Answer: "There are no Republicans at an Americana concert!" McCauley and Fritz play roles akin to that of Clark in the original film in that they are often the pivots around which things happen in the outlaw subculture. You can decide for yourself whether these folks are heroes or fools, but let's return to the continuity theme. Price does as Szalapski and allows images to speak for themselves. If you've seen the original, you will recall Townes Van Zandt's ramshackle DIY homestead; in this film, you will see several analogs: mold-covered houses, shabby interiors, urban farmyards, and tool-and-debris-strewn properties. Price juxtaposes official Nashville—auditoriums, tourist traps, glitzy lights, and posh clubs—with strip mall streets, roadhouses, sweaty bars, fried food, grit, and life on the margins. Everyone in the film seems to be overly tattooed, clouded in cigarette smoke, and working their asses off to stay afloat. Shovels and Rope play more than 150 gigs a year, and you will see that it buys them a very modest lifestyle. In fact, only Shelly Colvin and Justin Townes Earle appear to sustain a standard of living that is remotely middle-class. Whether or not you approve of their choices—and who are we to judge—outlaw musicians exude a raw honesty that is indeed lacking in mainstream country music. I'm not even sure it is country music. Deer Tick is often a damn good alt.rock band, and the balladry embraced by others could just as easily be called "folk" music. The outlaws are absolutely correct to note that what you see on Country Music Television is as processed as Cheese Whiz. In that spirit, let me offer a listener's guide to this film. Check it out and then download the film. My favorite songs are marked with an asterisk. 3. "Visit Me in Music City" by Bobby Bare, Jr.
Now pitching for the Yankees, Charley Brown . Hold onto to your socks! In March I predicted that the Yankees weren't good enough to supplant the Red Sox atop the AL East. The Yankees' misplaced hope of doing so ended last weekend. The Yanks are now playing for home turf in the Wild Card game, if they even get that far. Don't get me wrong; if the Yankees make it to the postseason, they could catch lightening in a jar and win a championship. I doubt it; this team has too many flaws, and it's not too early to start thinking about 2019. Here's where the fixes should begin. Manager: I also noted in March that you don't hand a $180 million payroll to a guy with zero experience. All managers were once rookies, but Aaron Boone had never even been a coach. It's starting to show. Am I being unfair given the number of injuries the Yankees have endured? Nope. Ask yourself this question: Can you fathom a Joe Girardi team looking so listless against the Red Sox? Girardi took squads that didn't really have the talent to compete and made them better. I also said that if the Yankees were going to replace Girardi with a neophyte, Hensley Muelens should have been the choice—a guy who speaks Spanish, Japanese, and Dutch. The rational thing would be to demote Boone to bench coach and let him learn the ropes. An interim Buck Showalter return makes sense. Pitching: Can we just stop with all the nonsensical numbers? Anyone who has followed baseball on the field rather than on data sheets would have told you that the Yankees needed starting pitching—even before Jordan Montgomery went down. This must be Priority # 1 for next year. It's a risk, but Clayton Kershaw should be the top target, followed by Dallas Keuchel, and Patrick Corben. Gio Ganzález is worth a look if the price is right. Of the late season pickups, I'd take a chance on Lance Lynn, but I surely would not break the bank for J. A. Happ. As for the bullpen, sign Zach Britton, as there is a high likelihood he is still rebuilding arm strength and will return to lights-out effectiveness. That would give the Yankees a way to avoid overworking Chapman. If the price is right, put out feelers on Andrew Miller or Cody Allen. If the deal is right for a starter, toss in Betances to get one. We know he will never be a closer and best to move him while some think he could be. Hang on to Domingo Germain, who will be good when he gains experience. I'm not seeing a high ceiling for Giovanny Gallegos, though, and he's expendable. So too is Luis Cessa, who would be better in the NL, like Ivan Nova. I also wonder if we've seen the best Jonathan Holder will ever be. Time to Part: I love Brett Gardner and I told anyone who'd listen that the Yankees were dumb to sign Jacoby Ellsbury. (Who's the fool now?) 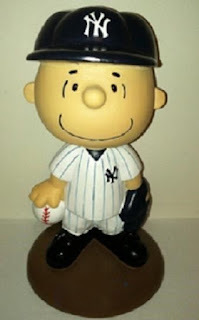 Alas, it looks as if Gardy is done. As of Monday, Gardner had just 10 steals and had scored a mere 66 times. You need more of both from a lead off hitter. Just dump Ellsbury. Period. Greg Bird is the next coming of Nick Johnson, sans his discerning eye. It's not imperative that Bird be replaced, but my instinct is to dump him before he breaks down completely. Neil Walker, like Brandon Drury, was a perplexing signing from the start. Waive[ sic] him goodbye. Tyler Wade is a solid AAA player who can't/won't get over the hump. I'd advance a player who has untapped potential and part with Wade. While I'm at it, the only player the Yankees have who was hitting over .300 is sitting in Scranton: Ronald Torreyes, who is exactly the kind of heart and spirit the team needs. One of two things needs to happen—either the Yankees need to put up with Giancarlo Stanton's mediocre defense on an everyday basis and make Gary Sanchéz their DH, or they part with the latter in a monster deal. He can't catch, which is why the Yankees top two picks were receivers. Remember how the Stat Heads dumped on Derek Jeter for his poor fielding and lack of power? What a bunch of idiots! In any baseball game, a Web Gem that doesn't affect the game one way or the other is just a parade preceding the circus. Jeter made nearly all the plays that mattered and, frankly, that's all that matters. Jeter also had nearly or more than 200 hits per year for most of his career. No one will approach that this year; Stanton leads the club with just 120. The sabermetrics crew will also tell you strikeouts don't matter. Of course they do! You have to homer or be on base to score—pure and simple. On this year's Yankees, Aaron Judge has walked 66 times and struck out 137; Stanton has whiffed 145 times. (Sanchéz has fanned 67 times in just 66 games.) Only one other player, Aaron Hicks, has walked more than 50 times. Put it all together and in 110 games, just four players have more than 100 runs (Stanton, Andujar, Gregorius, and Judge). Even this is deceptive, as the Yankees lead MLB in homers. No matter who tries to talk you out of it, the Yankees hitters really are an all-or-nothing. This won't change until less emphasis is placed on launch angle and more is paid to on-base-percentage, cutting down swings with two strikes, and bringing back the shame of striking out, failing to advance runners, and not plating a player from third with less than two outs. I don't care how much crow management has to eat, grovel and bring back Chris Chambliss as hitting coach! Here's the only pitching stat that matters: wins versus losses. It's usually correlated with a low ERA and low WHIP, but not always. A great pitcher adjusts according to the situation. In an 8-2 game, for instance, that pitcher stops nibbling and doesn't sweat a solo homerun or a single here and there; he knows that more trouble comes from walking players, rising pitch counts, and a tired bullpen. He also knows that efficient outs top strikeouts. Free Agent Eye Candy: No to Bryce Harper. He would be Ellsbury all over again, a pricey redundancy. Where would he fit in an outfield that already has Hicks, Stanton, and Judge, with Frazier, Florial, Amburgey on the way? Spend on pitching, not more mashing. Maybe yes to Manny Machado. They could then dangle Gregorious as trade bait. But only if Machado doesn't cost so much that pitching is again ignored. Machado is a great hitter, though his defense is so-so at shortstop. Let me be Old School once again and quote a time-tested adage: good pitching beats good hitting most of the time. That's why the Red Sox just made the Bronx Bombers look like bums. I’m on a long library waiting list for The Only Story, the latest novel from Julian Barnes, so I decided to re-read his 2011 Man Booker Prize-winning The Sense of an Ending. My second reading was even more satisfying than the first. Barnes borrowed the title from theorist Frank Kermode, who investigated, “making sense of the way we try to make sense of our lives.” This device clues us that our main character, Tony Webster, will be an unreliable narrator. What Barnes gives us is, both literally and metaphorically, a “sense” of what happened in the past. Did yesterday really happen the way we recall it? Barnes’ brilliant novella is divided into two parts, Webster’s school days, and the events of 40 years in the future that trigger a desire to reconstruct yesteryear—if, indeed, such a thing is possible. We meet Tony and his chums, Alex and Colin, in their public school (which means “private” in Britain) in that confusing time of late adolescence when in which fecklessness and burgeoning intellect collide. Their perception their own cleverness is severely compromised when Adrian Finn enters their orbit. Try as they will, there’s no hiding the fact that Finn is a true intellectual and is far more gifted than they. Hormones complicate matters. Tony acquires a girlfriend, Veronica Ford, but she is socially and economically out of his league, as he discovers in an extremely awkward weekend with her parents in the countryside. Upon graduation, Adrian goes off to Cambridge, and Tony settles for reading history at Bristol University. By then, he and Veronica are off, but it still unsettles him when Adrian asks his permission to go out with her. We thought we were being mature when we were only being safe. We imagined we were being responsible but were only being cowardly. What we called realism turned out to be a way of avoiding things rather than facing them. Time… give us enough time and our best-supported decisions will seem wobbly, our certainties whimsical. Whatever solace Tony took from his quiet life is disturbed when he receives a surprise post that includes a small check from the estate of Sarah Ford, Veronica’s mother, and a solicitor’s letter informing him that he has also been left a diary kept by Adrian. The kicker is that the diary is in Veronica’s possession, and he hasn’t seen her since his university days. Tracking her down opens doors Tony long ago nailed shut. Veronica’s reluctance to part with the diary both intrigues and baffles him, as does the fact that she seems to hang out with psychologically damaged and mentally challenged people. The select photocopies she shares, however, make Tony ponder what he knows of his own life, let alone the circumstances of those who were once so important to him. —bathwater long since gone cold behind a locked door. That’s simply amazing writing—at once tantalizing, vivid, and enigmatic. Every word of it matters. 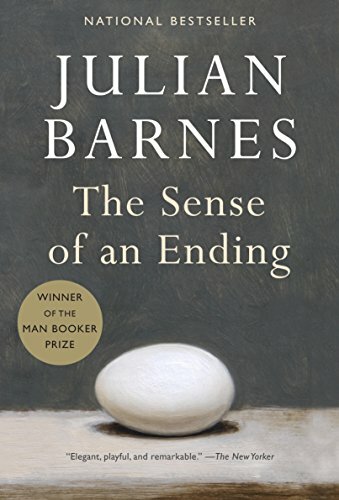 The Sense of an Ending ranks among such great coming of age novels as Evelyn Waugh’s Brideshead Revisited and John Knowles’ A Separate Peace. It is, at once, a sad tale and an object lesson on memory. Is it any wonder the list is long for the new Julian Barnes novel?